Home Our Garage Door Services Garage Door Maintenance Galvanized or Non-Galvanized Garage Door Parts? Are you among those people, who wonder whether to get galvanized garage door parts or not? Well, the real question is whether galvanized parts will make any difference to your life. The question also is whether all parts must be ordered in galvanized steel or just some of them. The truth is that manufacturers use galvanized steel for the construction of garage doors and their components in order to fight weakness. As we all know, galvanized materials are used for higher moisture resistance. What happens is that steel undergoes a special processing in order to become resistant to corrosion. So, if galvanized components are better, why do we still wonder whether to get them or not? There is some ambiguity about the strengths and necessity of galvanized components. Although the galvanizing process is not new in the construction industry, don't forget that the overhead door parts are not changed every year. Some stay with us even for decades. So, when the time for their replacement comes, it's good to ask questions. Steel is galvanized after going under a procedure of being coated with zinc. The truth is that the methods differ. When steel is hot-dipped, zinc actually blends with steel and makes it much stronger and resistant. It won't be as resistant if it is just sprayed with zinc. The resistance will be superficial. Zinc coated garage doors and parts must be resilient to scratches, sea salt and moisture, so they won't oxidize or as we usually say, they won't rust. The problem is that garage systems must have very durable parts. It is noticed that galvanized garage door torsion springs are not as durable as regular ones. They lose their tension easily and need readjustment every now and then. 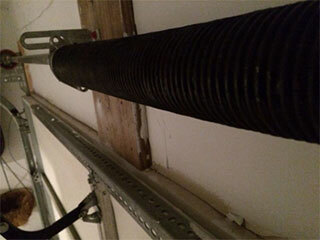 An added problem is that every time you requiregarage door torsion spring adjustment, you face other problems as well. As the door won't be lifted easily due to weak springs, the opener will suffer and the strengths of the springs will decrease. In the case of tracks though or the door itself, galvanized steel is ideal. In these cases, the great properties of galvanized steel triumphs and you will enjoy them for a longer period of time.